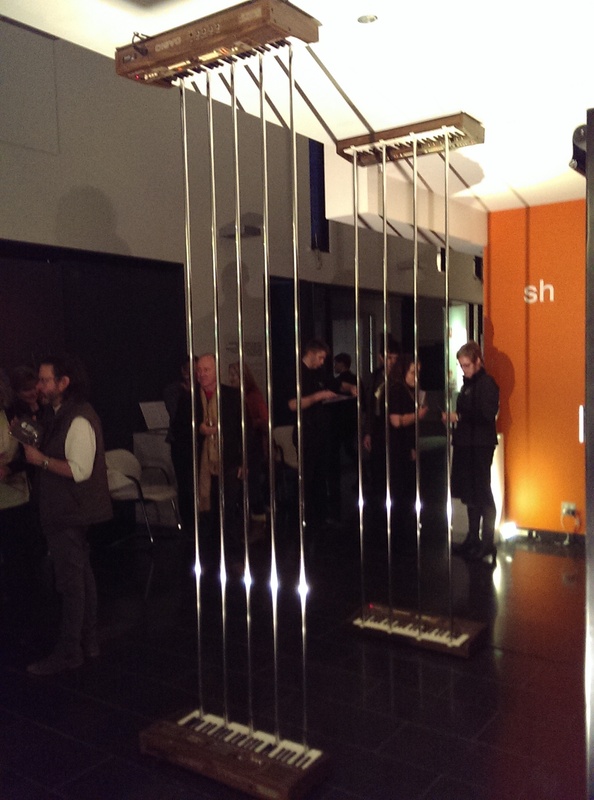 In Lovers, Julian Day pins two pairs of matching synthesisers to the floor and ceiling of the La Trobe University Visual Arts Centre with metal rods. The wit of this simple installation becomes evident as you move around the room, listening to the droning, beating, dissonant sevenths and ninths emitted by the four Casio keyboards. An earlier version of the installation was called Twinversion, which highlights its very material practice of musical inversion. Day’s playful approach to the concept is entirely warranted by inverson’s own varied and non-standardised practice. Since the beginning of music notation (and probably beforehand) composers found that they could invert a melody by loosely flipping its contour on a horizontal axis, that is, when restating a melody, they could “go down” where they “went up” and “go up” where they “went down” in the melody’s first appearance. In music from the baroque period onward, “inversion” can also mean taking one or more of the notes from the bottom of a chord and putting it on top of the chord while keeping the other notes of the chord in the same place. In the twentieth century a range of more precise inversions were developed, aided by mathematised music theory. If one represents the pitches of the chromatic scale as the numbers 0–11 and represents a chord as a set of these numbers, say the C-major chord [0, 4, 7], then one can very precisely invert a chord, or a melody, or an entire piece if one wanted to, by choosing a point of symmetry and adding and subtracting the interval between that point of symmetry and each note, but in the opposite direction. In the same way as the notes of the chromatic scale loop after every twelve semitones, the numbers here are imagined, like a clock face, to loop between 11 and 0. In the case of the C-major chord, one can choose 0 as the point around which to invert the C-major chord and produce the chord [0, 8, 5], or an F-minor chord (in this example, the order of the notes and their absolute pitch, or placement in particular registers, is not important). Mathematicians will talk about a function, such as the inversion described above, “mapping” each element of a set onto another. 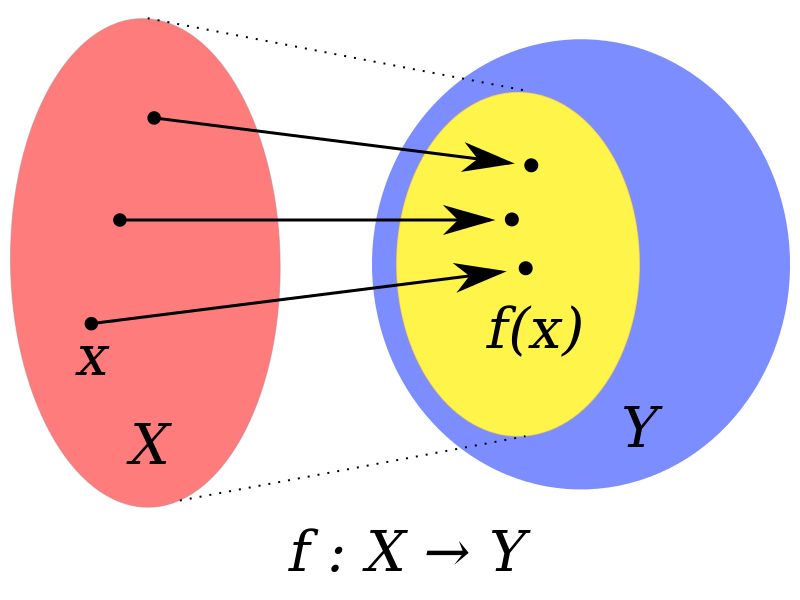 A function can be expressed as an arrow when illustrating these maps, as in the diagram below. A function f from X to Y. Wikipedia. Public Domain. And this is what I thought of when I saw Day’s keyboards pinned by metal rods to the ceiling. But just what sort of function are Day’s metal poles? Each keyboard plays the same notes as its inverted twin. There is thus no inversion at work in the senses described above. The first pole simultaneously plays the lowest and and the highest notes of the chord. The second plays the second lowest and the second highest. The function is thus one from the same to the same, but each path between the notes is different. The function is one of absolute intimacy where the other is the same, where each part of one chord knows every note of the other. The installation runs until October 5, 2014.